Back to school means a cool backpack is needed and now there is a Spider-Man up close backpack. And this is not just a simple Spider-Man backpack it is one that shows an amazing image of Spider-Man and you see him really up close. The backpack is made by Bebamour and is 11 x 16.5 x 5.5 inches and offers insides pockets and can even hold a big laptop. On the sides, you will find two mesh pockets. So your new superhero backpack is waiting for you and you can use it for school, work, and other adventures. 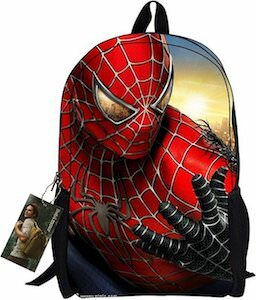 If you like Spider-Man and like to have him on your back then this backpack is what you need.